One of the main activities in Singapore is eating. I learned this on our first day when we arrived at our first Hawker Centre, completely bemused by the sheer amount of stalls serving up all kinds of dishes I wanted to try. A family sitting near by sensed my curiosity and asked us to sit down with them and try their breakfast. A sort of crispy pancake that you dip into sugar and coconut. Delicious. The old grandma in the corner started motioning with her walking stick for her daughter to go and buy us a plate, she willingly obliged and a lovely brunch ensued. We were quite taken aback by their hospitality, and ever so grateful for it. I’d like to pay it forward and tell you about the most wonderful eating experiences I had in Singapore so you may enjoy it as much as we did. Singapore is where our Asian odyssey of 2016 began, and it’s a great place to break you into Asian culture gently if you haven’t been before. Here, the modern world and ancient cultures mix together seamlessly, in a way that made me realise London has no idea what diversity really means. Malaysians, Indians, Chinese and westerners all live together in harmony, speaking their own language, English and often one or more of the other main languages too. I can’t imagine any Londoner attempting to learn Arabic, which would certainly be the equivalent, and will probably never happen. But that’s a whole other conversation for another day. It was a pleasure to take a couple of days to get to know this city, mainly though my favourite medium of… Food! It’s all about hawker centres in Singapore, restaurants are quite sterile in comparison and you’ll get a far more authentic experience if you eat with the locals. They’re a truly brilliant invention. Street food is central to the culture here but out on the street theres was no way to guarantee hygiene, so they created purpose built centres for all the stalls to relocate to, resulting in these wonderful hawker centres all over the city full of hundreds of small stalls that usually specialise in one or two dishes. Always take a small portion so you can try two or three dishes! This is a firm favourite amongst locals and tourists alike. Many come here for the local specialty of Hainanese Chicken Rice which people rave about but I found to be a bit colourless for my liking. So I finished off with Wanton Mee, my favourite noodle soup filled with wantons, bbq pork and greens and it was delicious. We also had some BBQ Beef Noodles which were incredible! This is the place to come for curry noodles (bee hoon mee), if you’re brave enough to have it for breakfast I salute you. It’s really best at this time as you’ll have all day to work off the calories, there are plenty in this dish! It’s spicy, flavourful and creamy and definitely worth the queue. The two best spots to go are Heng Kee downstairs, or Ah Heng on level 2, stall number 58. Ji Ji Wanton Noodle Specialist (level 2, stall 48/49 open 8-7pm Monday – Friday, or until 3pm on Saturday) also do a delicious wanton noodle soup. 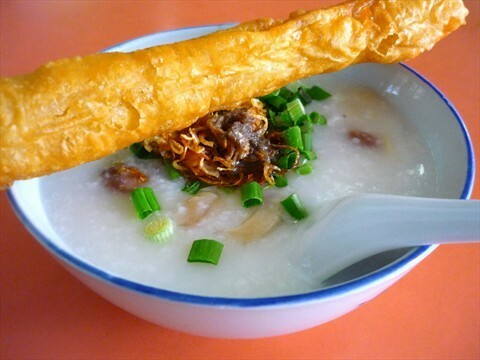 They also won best hawker centre of the year a while back, and they’ve been in business since 1965! This is one of the biggest we visited and the sheer volume of stalls and choice is quite overwhelming. Take your time and enjoy the electric atmosphere and glorious smells. Here we tried everything out hearts desired; roast hoisin duck, chicken wings, dim sum, japanese noodles and more. Many people rave about the claypot rice here, but unfortunately I was too full by the time I found it! For more information on it check out this blog. At night, this street is pedestrianised and comes alive with satay stalls as far as the eye can see! The atmosphere is wonderful, full of groups of friends chatting, drinking beer and ordering more and more satay until they are full. “Best Satay” at stall numbers 7 & 8 really are the best, I tried them all 😀 There is also a decent hawker centre on this street if you fancy something else afterwards! The best place to come for a real biryani. 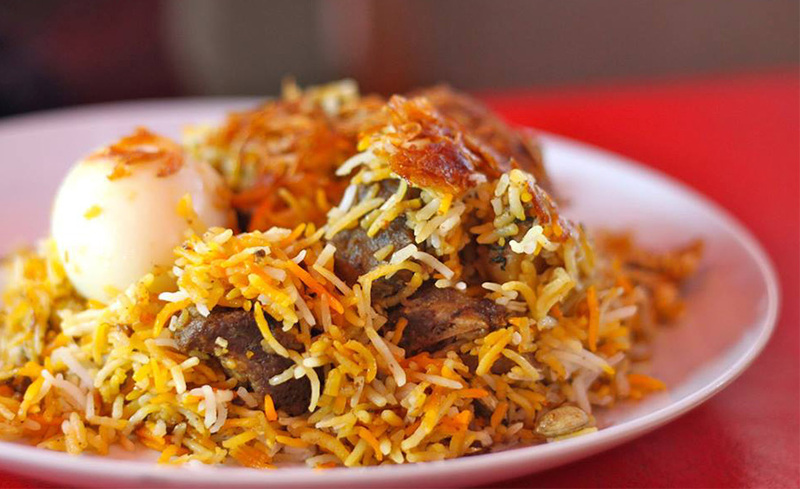 Head into downtown little India for some great biryani. Bismillah at 50 Dunlop Street in the most popular but was closed when we visited on a Monday. Further down this street we found a great place that looked authentic enough, with plenty of Indian people in it so we assumed it couldn’t be that bad. We weren’t disappointed. It taught us a good lesson- we can’t always follow maps and recommendations when we’re out and about so just trust your nose and look for locals and you can’t go far wrong! Accommodation here is beyond expensive, with the cheapest places to be found near Little India or Chinatown. I’ve stayed in both and found Chinatown to be more convenient but transport is excellent in this city and you’re never far from somewhere fascinating to explore. Google maps is your best friend here, use it to find your way anywhere by bus or metro. If you ever get lost, the chances are a local will ask you if you need help before you do! Read more about visiting Asia here. For help planning your next trip to Asia, and for personalised recommendations just pop me an email on lauren@theholidaydesigner.co.uk.